Sustained catch in Genesee County : Spotted Wing Drosophila Latest information from the NYS IPM Program. 14 SWD were caught on July 10, 2017 in two traps set in a raspberry planting. 7 females were in the trap set within the crop; 4 female and 3 male SWD were caught in the trap set on the edge of the planting. 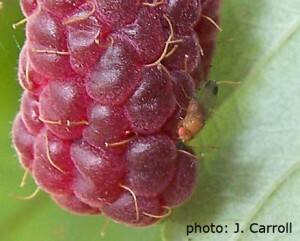 Male SWD on raspberry fruit. Note dimpling on the fruitlet in the upper left corner of the photo – indicative of fruit infestation. These traps are being serviced by Jan Beglinger, extension educator, Genesee County Cornell Cooperative Extension. Insect identification is being done by Nicole Mattoon, IPM field technician, and Taylere Herrmann, IPM summer technician, NYS IPM Program.